There’s a saying in french: « Le style, c’est l’homme ». This can apply to art (litterature, painting, etc…) but also to the way of dressing and, more generally, of living. We all can see the « stamp », the « touch » of a person and have a hint of the way he or she behaves in life and society. It is as if our identity card were displayed on our forehead and says it all. By identity, I mean of course not the name but the personality in depth, the signature (don’t we recognize our handwriting like our face in a mirror ?). In singing, the above remarks are obvious, not only in the « apparent » style, which could be conveyed by the nature of the work (witty, joyful or serious, religious, dramatic etc…) but by the in depth style, the one that underlines everything you do, your second (or first ?) yourself; something which is always present, no matter what the singer sings, and which underscores everything he or she does or says. Every line, every word is full of the singer, is the singer and it’s immediately the moment of truth, the personality cannot hide behind a curtain of technical tricks or try to make us believe in feelings and sentiments that are not deeply felt. Just don’t try to emphasize the heart of the matter by insisting on a tone or on a word if you are not deeply, totally involved in what you’re doing. It will sound artificial, superficial, even if it is technically a success. Just think of those virtuoso pianists or violinists who leave you exhausted by their technical and perfect skills but at the end of the performance, no emotion, just the encounter with cold perfection. What happened ? Milstein answered humbly that he was not satisfied with what he had done. His opinion came as a death sentence in the middle of the dinner. The following day, Toscanini told the two great musicians that he had listened to the tapes again and he, too, was not happy with the recording: he admitted Milstein had been right, although he had been delicate enough to speak only about his supposed « lack of soul » during the recording session. In fact, all of them had not been in their inner self and their music, that day, betrayed them. The lesson: be yourself, tell your truth and be genuine, no tricks, you are what you are, don’t lie ! The other day, I was on my way to a voice lesson and I was listening on my Ipod to several versions of « Ideale », by Tosti: I had Placido Domingo and Itzhak Perlman’s violin, Ben Heppner, Tito Schipa, Jussi Bjoerling in concert at Carnegie Hall, and Mario Lanza in his « Mario Lanza, The Great Caruso », all of them splendid artists and accomplished singers. I left Lanza for the end, because the first one you start with takes an advantage, his performance remains in the ear and becomes the standard on tempo, tone etc.. and I did not want to give some advantage to Lanza in my « testing/tasting ». I liked all the performances but I was touched by Bjoerling and the sadness of the glorious voice, which made something different of that love song. Schipa, the Master, sang beautifully as ever, but just sang, and I felt the same with Domingo. Heppner was unexpected on Tosti but did justice to the magnificent melodies in his remarkable CD « Ideale », although his voice seems more suitable for Lohengrin and the english melodies or french opera (see his splendid renditition of « Nature , immense, impénétrable et fière », from la Damnation de Faust, by Berlioz). Then came Lanza, with a slightly slower tempo, and then came the dark medium voice singing in dark tones and mood, and it was another world: again it was no more a love song but a dramatic poem on absence and yearning for the soul mate (« Io ti seguii come iride di pace, lungo le vie del cielo/ io ti seguii come un amica face della notte nel velo » – I followed you like a rainbow, on the paths of the sky/ I followed you like like a friendly face, in the veil of the night)-); and like a prayer, « Tooorna, caro ideal, torna ogni istante a soridermi ancora » / e a me risplendera nel tuo sembiante una novella aurora, una novella aurora ». (Come back, dear ideal, come back at once and smile to me again/ and to me, on your face will shine a new dawn, a new dawn). Lanza had instinctively understood that the beautifully simple melody was more than a love song and that the words and the sort of majesty of the music contained something deep that needed a treatment of restraint and simplicity, not a voice competition on who is going to ring better on a high B. 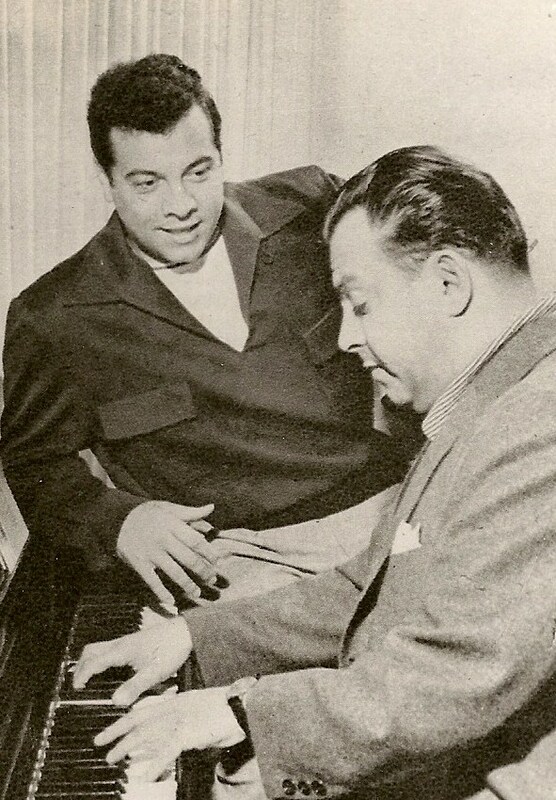 In that regard, only Mario Lanza respects the composer on the finale « una novella aurora », that all tenors, as a tradition, take with a bright and valiant high B on « Aurora« . Not Lanza, who stands on the medium line that Tosti wanted and this respect for the opus gives the aria the serenity of a prayer, with the help of the slow tempo, the rich and colorful wonderful medium and the astonishingly clear diction, each letter of the alphabet pronounced so perfectly that you seem to see the lips shaping the words. Emotion flows pure, no display nor vulgar show, but restraint and density, and the final « aurora » (dawn) is strangely outbreathed by emotion, and sounds like the word « parola » (word), which is quite a symbol of Lanza’s love for the words, words of love, words of peace. Listen to « Ideale » sung by Mario Lanza. Lanza, before singing « You’ll never walk alone », from Carrousel, speaks with that gentle voice of his and says: « One of the things that makes the music of Rodgers and Hammerstein great is the fact that so often the songs convey a thought worth remembering ». What can you expect from a man who has his car stopped by a little church, just to pray alone and prepare himself on the way to the studio where he is to record prayers like « I’ll Walk with God » and The Lord’s Prayer »?